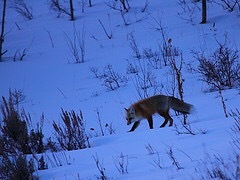 Elvis’s short, low-pitched woof from the back of the couch rewarded a glimpse of the fox. A phantom, it moved across the yard in the single digit air, this cold morning’s nautical twilight. It trotted along the field edge of the side yard, angled across into the trail cam’s field vision, leapt onto a broke-back wagon, and melded into the brambles. Twenty minutes later a sailor’s warning painted the tattered clouds cameo pink. This entry was posted in Uncategorized and tagged #smallstones #noticing. Bookmark the permalink.